Humans would spend more than a year orbiting and bouncing on the Martian moon Phobos under a mission concept developed by students at the International Space University. The very theoretical MARS-X mission—presented more as a concept than a firm plan—would see technology development taking place from 2018 to 2022, with communications satellites and rovers winging their way to the planet to be used by astronauts. In 2023 to 2024, the spacecraft would be built in low-Earth orbit, requiring several launches to accomplish the massive task. 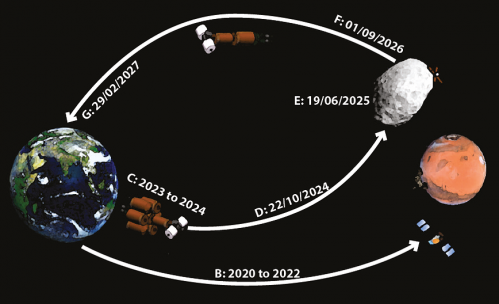 Astronauts would then depart in 2024, spending eight months in transit before arriving at Phobos. There, the mission would last 495 days, and the astronauts would take five months to get home. While NASA and Lockheed Martin helped sponsor the students who created the plan as part of their academic work, the concept itself is not yet funded beyond the students' initial development. But Piotr Murzionak, a member of the ISU team, said the proposal is one way that could help fuel interest in space exploration, if it was to be executed..
"It paves the way to Mars. It will be the initial step towards the landing mission on the Martian surface, but without the extra risk involved in order to land directly to Mars," Murzionak said. The Mars Exploration Vehicle (as the crew vehicle would be called) would use nuclear propulsion and liquid hydrogen to bring two habitats along with it. One of those would (along with several fuel tanks) be used on Phobos for up to 40 days of surface operations. It would travel during solar maximum in 2024 to reduce the effects of cosmic radiation from outside the solar system, since the sun's activity would blow the radiation further away. Further, the crew would be protected from solar flares with high-density polyethylene, as well as a temporary solar storm protection chamber lined with 50 centimeters of water. A graphic detailing the MARS-X spacecraft and technical performance. Click for larger version. Credit: MARS-X. The students estimate this would cost about $20 billion, but it could go to at least double this due to factors such as "the volatility of political systems and the large amount of bureaucracy involved in any such endeavor," they write in their final report, which is available here. 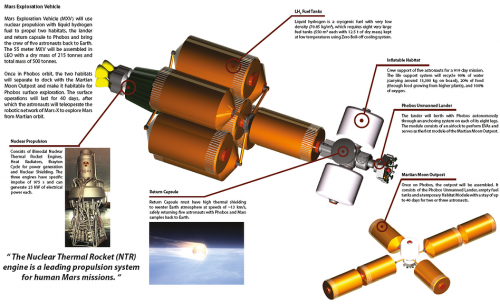 20 billion+ USD and requires a nuclear thermal rocket? Too complex and too expensive. Back to the drawing board, kids. And anyhow, Deimos makes more sense for a number of reasons.